#5882: The My Future Business Show is seeking Startup Entrepreneurs - Radio Guest List.com - How to Get Radio Interviews and Find Podcast Guests! The My Future Business Show is currently taking a limited number of applications to appear on the popular My Future Business Show. We are looking for Startup Entrepreneurs. Welcome, my name is Rick Nuske, and I'm the host of the popular My Future Business Show. The My Future Business Show offers one-to-one interviews that provide you with an effective way for you to get in front of your best audience and stay there. As an invited guest, you get much more than just an interview. This is an opportunity to get your business in front of hundreds of people both locally and abroad, who are looking for what you have to offer. The show has been going for several years, and I have had the absolute pleasure of spending time with some incredibly talented business owners, entrepreneurs and authors over the years. So, if you're looking for an effective way to get in front of a growing group of people who are looking for what you have to offer, book your spot and I will speak with you soon! Our audience numbers range between 8k to 10k unique and return viewers per month across our combined distribution channels. Our audience is made up of entrepreneurs, people who are interested in business building, those who love technology, and people who are interested in books and authors. All calls are pre-recorded in a relaxing, non-stress environment. It is a warm, friendly environment where I help you get the results you're looking for. There is an application form that walks you step-by-step through the entire application process. You have the opportunity to provide your bio as part of the application process. On completing your application, you will know exactly when, where and how the interview will take place. As the application process is automated, it takes only a few minutes to book your spot on the show. There are a few key reasons for this. 2. It attracts high-caliber guests who values their time on the show and what they get in return. Additionally, when compared to other paid marketing options, not only does The My Future Business Show offer exceptional value, it also eclipses all other forms of paid marketing that you might decide to invest in. 1. 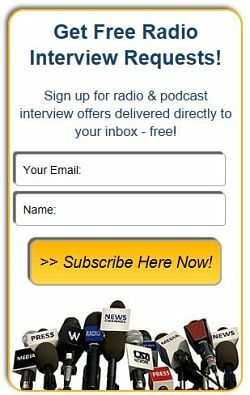 Your interview is distributed across all of our existing audience channels that we have worked tirelessly developing over the last 5 years. 2. You receive an MP3 audio and MP4 video of your interview that you are free to use to further promote your business well into the future. 3. Your call is permanently listed on the My Future Business website, which attracts hundreds of unique views each and every month. Please be sure to review the entire page link above as there are additional features and benefits listed on that page.